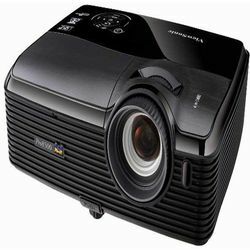 The ViewSonic Pro8500 is an advanced high brightness DLP installation projector which includes BrilliantColor technology to produce more vibrant colors. The Pro8500 delivers 5000 lumens, 4900:1 contrast ratio with a 1024x768 XGA native resolution, allowing it to shine in virtually any lighting situation. The Pro8500 provides maximum mounting flexibility with a wide 1.5X optical zoom adjustment and a multitude of connectivity options including Network Display, USB, and WiFi. The filter-less design and long lamp life provide for easy maintenance and low total cost of ownership. The ViewSonic Pro8500 is an advanced high brightness DLP installation projector which includes BrilliantColor technology to produce more vibrant colors. The Pro8500 delivers 5000 lumens, 4900:1 contrast ratio with a 1024x768 XGA native resolution, allowing it to shine in virtually any lighting situation. The Pro8500 provides maximum mounting flexibility with a wide 1.5X optical zoom adjustment and a multitude of connectivity options including Network Display, USB, and WiFi. The filter-less design and long lamp life provide for easy maintenance and low total cost of ownership.